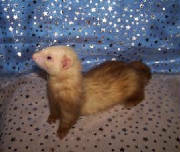 Find out more about our kits that are currently available, as well as the litters we have planned. Currently, we do not have any remaining kits from the 2005 breeding season...all have been placed thusfar! 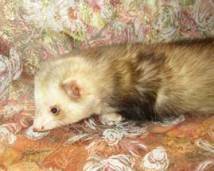 Please take a look at our upcoming litters if you would like to reserve a kit in the future, or check out our Retired Breeder/Show Ferret link in the navigation bar for other available ferrets. The 2005 Breeding Season is underway! Below is a list of upcoming litters and pictures of the expecting parents. If you are interested in reserving a kit from any of the upcoming litters below, please email us at the link below. 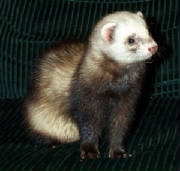 All prospective ferret parents MUST fill out an adoption application and have their current ferrets tested for ADV and current on vaccinations prior to adoption. This will be Imajica's first litter. We're hoping that in breeding her to Harley, who has a very nice head structure, we will compliment Imajica's more narrow features in the resulting kits. Harley is 75% English and a real cuddler. Anything's possible in terms of the colors the kits will be...both parents have varied backgrounds. Faye is Bebop and Charlene's mom. Harley is 75% English with an awesome structure and personality. I expect one heck of a good litter from these two, hopefully with some black and mitt kits. Deposits and reservations are required to hold any kit. Please email Jen at losofiowa@yahoo.com or call 712-256-3074 for more information about upcoming litters and reserving your special baby!